During Thomas Harden’s time as Chancellor, UWGB experienced enrollment increases in returning adults and students of color. The school also received its largest gift to date: A $5.5 million contribution from Dr. David A. Cofrin. Taco Tuesday, The Grill, paninis, and build-your-own pasta bar, A’viands was brought in to run the dining program once Sodexho left and these were just a few of the changes they made. Students were happy to have quick, easy options that they could grab on their way to and from classes. Four-person apartments with private bedrooms, kitchens, bathrooms, central air – it’s a step up from the residence halls of yester year. Keith Pamperin Hall, named after the 1970 graduate, opened with fully-furnished housing for 126 students. The apartment building quickly became a student favorite – only a few feet away from the Union. Our small school drew a big NCAA spotlight in 2011. The women’s basketball team shocked the brackets as they took down Big Ten Champion Michigan State: 65-56. That win continued a 25-game winning streak and gave the team a historic record of 34-1. They advanced to The Sweet 16 to face Baylor University. Their sensational season came to a bitter end when Baylor beat the Phoenix and sent them home with a historic first: The Sweet 16. After deciding to turn up the heat on the UW-Green Bay brand, the slogan “360 Degrees of Learning” was born. Created under Chancellor Harden, the slogan was intended to be a promise that UW-Green Bay students will learn to examine and solve problems from multiple perspectives. However, the Harden trademark received its fair share of criticism from the campus community. Gary Miller, the sixth chancellor of UWGB, was chancellor of the University of North Carolina in Wilmington, but was thrilled to become a part of the Green Bay community. Miller holds a Ph.D. in biological sciences from Mississippi State University. He earned his master’s and Bachelor of Science degree, both in biology, from the College of William and Mary. Over the hill or just beginning? UWGB reached a milestone as it celebrated its 50th Anniversary with special events, ice cream socials, concerts, alumni reunions – even decorations around the campus. The campus spent the year reminiscing and thanking all those who helped make UWGB the institution it is today. UWGB went through major reconstruction of its academic administration from a two-to-a-four-college model. 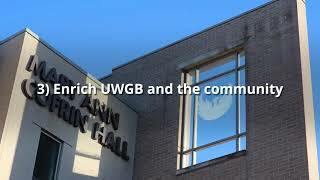 The University of Wisconsin Board of Regents came to this decision that categorized students at UWGB into: The College of Health, Education, and Social Welfare; The Austin E. Cofrin School of Business; The College of Arts, Humanities, and Social Sciences; The College of Science and Technology. Each year, The Campus Pride Index ranks LGBTQ+ friendly colleges and universities. Since 2015, UWGB has ranked in the Top 25 in the country ranking highly in all categories: Policy inclusion; support/institutional commitment; academic life; student life; housing/ residence life; campus safety; counseling/health; recruitment/retention efforts. Approximately 200 students, staff, alumni and community members gathered on March 30 as UWGB hosted Donald Trump at the Weidner Center for a Town Hall with Chris Matthews of MSNBC. The event was not without disapproval, however, as protesters gathered outside to demonstrate opposing viewpoints. Many consider this town hall to be one of the most notable for Donald Trump as he was challenged by a question about reproductive rights from UW-Green Bay’s Tanya Niemi. Thousands attended the Bernie Sanders rally on April 1. There were hardly any anti-Sanders protesters- though some individuals dressed in Trump attire attended the speech but were silent during the presentation. Natural light filters into brand new space for collaboration, study and reflection. The redesigned Library Commons has amenities for students, faculty and staff alike. With modern furniture and cool study and collaboration spaces, The Commons creates many new ideas for future meetings and events. Team Members: Amanda Jo Danihel, Amanda Rice, Courtney Bultman and Sara Bichler. Previous Post - Previous post: Social Media Rumors True: Let’s PLAY BALL! Next Post - Next post: Fine! Then Imprisonment?